• Never use a generator indoors or in an enclosed area such as a garage. Generators emit toxic carbon monoxide from the engine exhaust. • A generator should only be operated in a well-ventilated and dry area, away from air intakes to the home. It should be protected from direct exposure to rain and snow. Do not attempt to restore power to your entire house by plugging the generator into a wall outlet. The electricity produced by a generator cannot only ruin your home's wiring and start a fire, it can also feed back into the utility system and energize a line thought to be without power possibly killing utility workers trying to restore power. It can also cause damage to the generator when electric service is restored. Handle fuel carefully. Turn the generator off prior to refueling. Gasoline, kerosene and other flammable liquids should be stored outside of living areas in properly labeled safety containers. 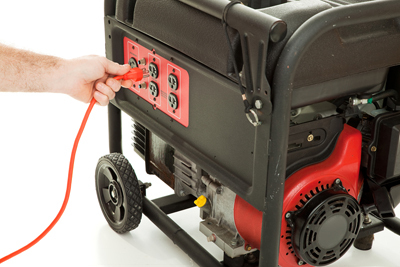 Turn off or disconnect all appliances prior to operating a portable generator. Once the generator is running, appliances powered by the generator can be turned on one at a time. MLGW will not come out to check the generator connections. Customer must use an electrical contractor to ensure that generator is isolated from grid to eliminate backfeed.